Pink Dandy Chatter Cook N Grow Kitchen by Little Tikes Giveaway! 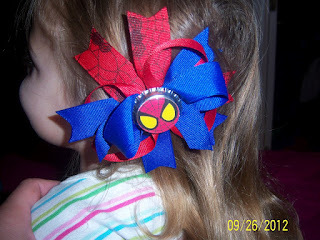 Spiderman Hair Bow Review and Giveaway! The bow is about 4.5 inches and super cool. My youngest son Joshua is major into spiderman so his sister Elizabeth follows in his step. 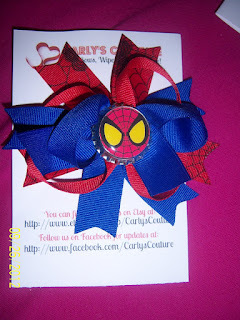 When I got the bow I called her over and Joshua came as well and I opened the package which was nicely wrapped, her eyes lit up and she yelled I want in (pointing to her head) very cute. Then I pulled all her hair back into a pony tail and placed it on her again. I believe I like this way best for the size of the hair bow it looked very cute here. The hair bow is made up of ribbons, a alligator hair clip, and finally a bottle cap as a center piece. This sets off the bow. I was very pleased to receive the bow and plan to use it now and for years to come. At Carlys Couture the owner Tracie has many other bows to choose from along with baby wipe covers and headbands. Prices are from $3 to $10 which is a steal for the quality that you receive. 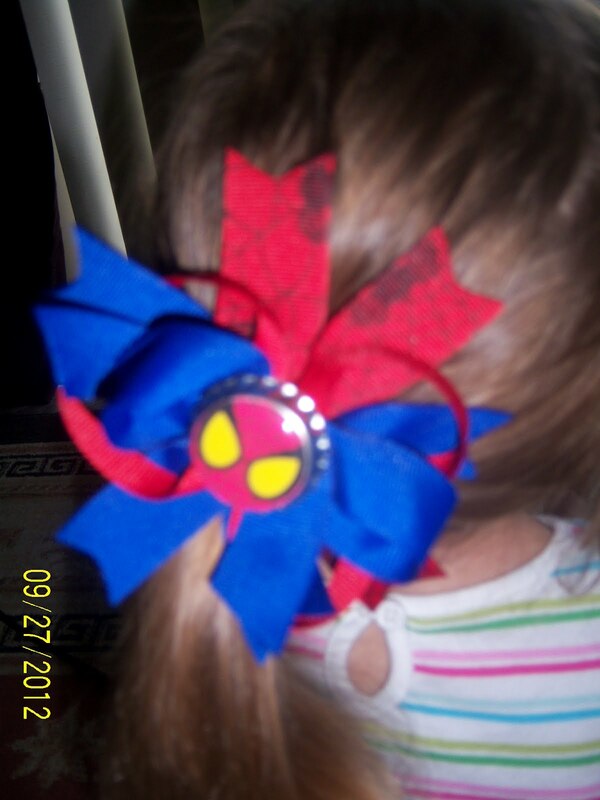 My daughter will be able to pass this bow on to her younger sister so I will make very good use of. Tracie has offered to do a giveaway which you will receive a chevron print from her shop Carlys Couture . Please fill out the rafflecopter bellow for a chance to win, open to U.S. residents only. Every day my kids get homework and everyday it's a struggle with Michael. I am at the end of my rope with him. I am not mad at him but with the system of help. Michael is 7 years old, he was in Kindergarten twice, and does not know his ABC's or 123's. We (my husband & I) have tried many times to teach him but no matter what we do he does not retain it. I am not sure what to do. The school is like "you need to make him try" really? I have tried! you're not here with us, you don't know what we do or don't! 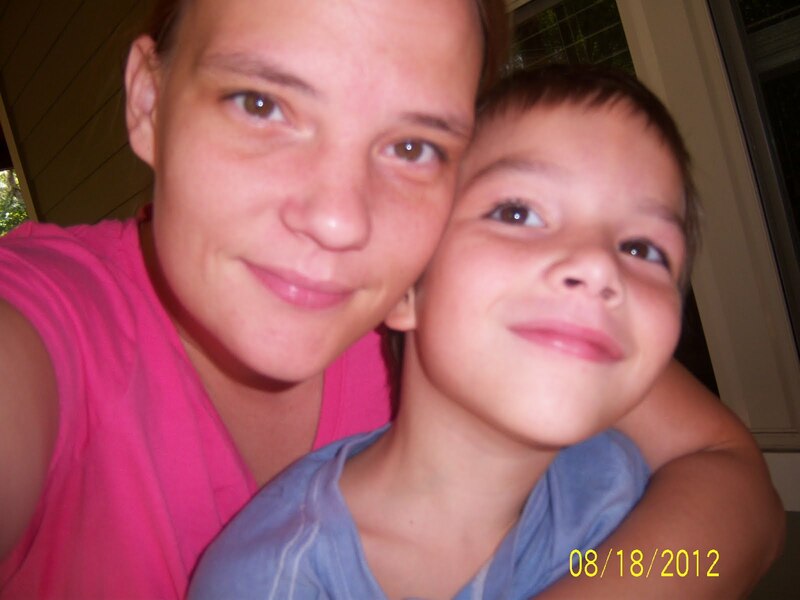 I am so over the school thinking it falls solely on us, I know as his parent I need to do what I can which I am but no one seems to think hey the kid could have a disability. I have tried to get a doctors opinion but insurance only covers certain doctors and the one he has gave me ME a paper had ME fill it out then said he has A.D.H.D. (which is what I wrote on the paper!) without ever talking to Michael. I want a doctor who can look at Michael and talk to Michael then give me a true reason why he is having such a hard time. I know my son can be stubborn it comes from me lol but still I doubt he would wanna do this and never move on with his life. I have seen him love school and work, he is an overachiever when he is told to do something he wants to do, and do it right! not do an okay job. The school claims they cannot move on to get him proper help until he does something like write his name or so on which I have seen his papers he does this so I am not sure what that is about. But if they can't get that much out of him why can't there be a problem before that?? I mean why does he have to show he can't how do you show you can't??? I am just lost on what to do I know he is not stupid I know he wants to learn but he just really seems not to be able to. He is a hands on child...hum maybe I should try teaching him his ABC's with braile. Honestly also I think he is dyslexic which no one has tried to point out, the teacher he had for 2 years in Kindergarten agreed that that could be an issue but people just assume at a young age that it's cause they are young and learning. I hope to find an answer before it's to late, cause I don't wanna make him feel like he just can't, and that he is "special" cause all kids have issues and we always have a way to work through it for the benefit of everyone. Personalized IPhone Case/Bottle Opener Review and Giveaway! I currently have a flimsy case and I am so worried that one day my kids will break it. When the case arrived I was so excited because it also has a bottle opener on the back. Not that we are big beer drinkers, but I could see how this would come in handy. The Gators decal is very nice on the case, It's not like a sticker that I have to worry will come off, and the case being an Otterbox, I know it will last a LONG time. Wedding Invitations, Bridal Shower Invitations, Bridesmaids Gifts, Bridal Party Gifts, Teen Gifts, personalized iphone case covers, Personalized otterbox cases and more! 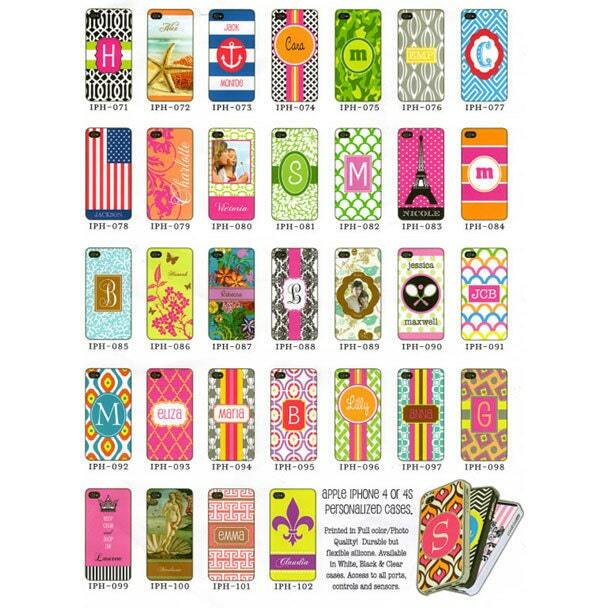 Prices for the iPhone cases start at $37.90 and you can create your own! Paper My Day has generously agreed to giveaway one of her iBottleopener Otterbox cell phone cases. So as I posted before, I am trying to get Xander's room more "big boy" than "baby" now that he is 7 years old. I knew I had to have one of their wooden wall plaques. Xander wants his room to have a big boy ocean theme, so no cute fish, just mean looking sharks/crabs/squids. This is the sign I chose and I think it's going to fit perfectly with our new decor. The sign is made of a distressed wood and looks very nice, it's not something I can find at a local "big" store which I love! beach & surf themed wooden signs on beautifully distressed reclaimed wood, one-of-a-kind paintings, colorful prints, and unique chalkboards designed for a beach house, cottage, nursery, or any coastal space. You feel your closest connections in your environment when surrounded with things that bring comfort. The Mango Seed offers items with a personal touch and a friendly relationship to our environment. Drawing from my personal vision, I create when driven by inspiration. 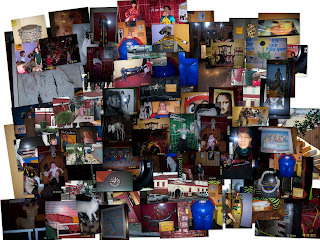 I get great satisfaction in bringing these creative inspirations to you. 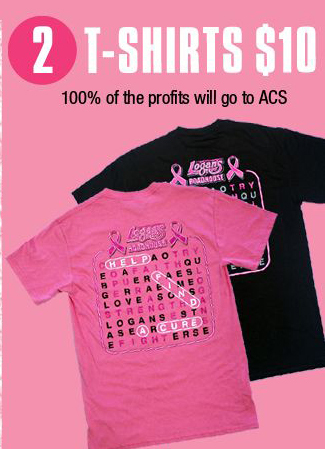 The prices start at just $22! That's not bad for an awesome hand painted wooden sign, I really love mine and so does Xander! 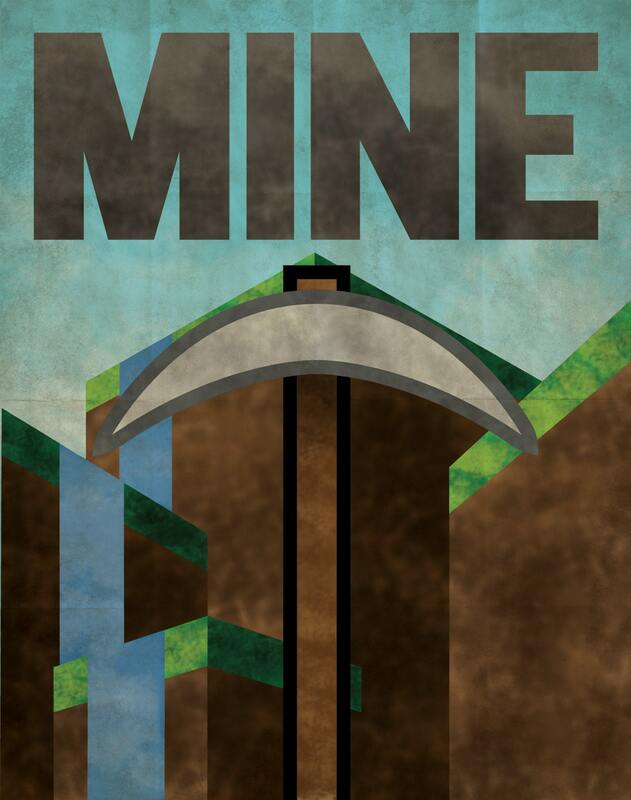 Minecraft Poster Review and Giveaway! We got the frame at Ikea for $3.99! Xander my 7 year old is obsessed with Minecraft. I let him play it on the Xbox. For Christmas he wants a laptop with Minecraft installed. It doesn't bother me that he loves it, it's alot better than most video games out there as far as violence, yeah there is some pig killing and some zombies but hey, better than shooting another human in a game. I knew he had to have it for his room. He is transitioning from the "baby" room to the "big boy" room. Right now his room is still decorated in cute little frogs and fireflies. When the poster came (in a poster tube) Xander knew right away what it was. Just One Scarf has 58 "propaganda" posters for sale. They are 11x14 in size, and great for framing! I know of 4 people who would love one of their unusual posters for the Holidays this year, and I bet you know one too! 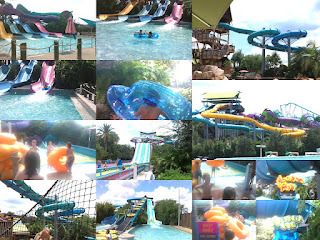 We were recently invited to experience SeaWorld's waterpark "Aquatica"
I had been before a few years ago back when Xander was about 3-4 years old and we LOVED it, and Casey had been once on opening day back about 6 years ago. Casey was able to just bring her 2 oldest, so we had myself, Casey, Xander, Brian, Michael and Riley which was really nice because of it being a waterpark we didn't have to worry as much about the non swimmers since they stayed home. Riley's favorite ride was the "toilet bowl" (Tassies Twisters) which i nicknamed that because you go down a tube and then plunge out into a huge bowl and spin around and around until you finally drop down the hole in the bottom, he is still asking me to go back just for that. His least favorite was the Roa's Rapids, which is like a lazy river on crack. There are no innertubes in Roa's Rapids, you just put on a life jacket (or not) and get in..the current is strong and it pulls you away really quickly. In a panic I went all the way around the rapids, using my feet to make myself go sonic speed, while Casey stopped and talked to a life guard about getting out (they wouldn't let her, even with a LOST child!) so she gave them his description and they said they would catch him if he came around. When I finally got back to the entrance, Riley was not there! After about 3-4 minutes I asked the lifeguard if anyone was coming and he said yes, and I said can you call around and see if anyone has found him and he said no he was not authorized to do that, only the person in charge of lost children could do that. Another 2-3 minutes passed by and I saw Riley floating by and I saw Casey jump out and grab him..well, grab and then float away with him since now they were both back in the current. As fast as I could I got back in and got to Riley. We went around a few more times as a group, but Riley later in the day said he didn't want to go back on that anymore. That was only the first issue of the day with the lifeguards. 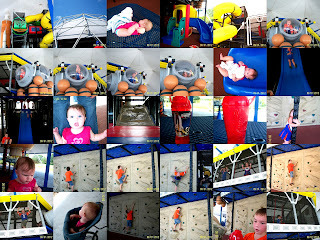 The second was with the Tassie's Twisters ride, I took Michael and Riley on this ride while Casey was with our bigger kids on the Dolphin Plunge. I sent Riley and Michael down first, and when I came down (in the innertube) I saw in front of me that only Michael was in the double innertube, and at the same time felt a hand underneath me (in the water!) I jumped out of my tube and Riley popped up from under it, all while a lifeguard watched and said nothing, just sat there smiling at us! What had happened was Riley said that the innertube he and Michael were in wasn't moving out of the small pool area that you land in when you come off the slide so he got out to push it, then my water and wave must have pushed the tube out of the way, leaving Riley at the base of the slide. If it hadn't been me coming out of the slide next I don't now what would have happened to Riley. 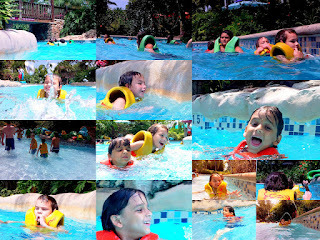 Riley is 6 years old and a great swimmer, so it's not like I had no business taking him to aquatica, in my opinion everything that went wrong could have been avoided with better lifeguards and proper signs. Overall, even with the mishaps, all the kids had a great time and want to return as soon as possible. Aquatica is located just across the street from SeaWorld on International Drive off the Beachline Expressway (FL 528), 10 minutes south of downtown Orlando and 15 minutes from Orlando International Airport. Click here for location and directions information. Click here for Operating Schedule. 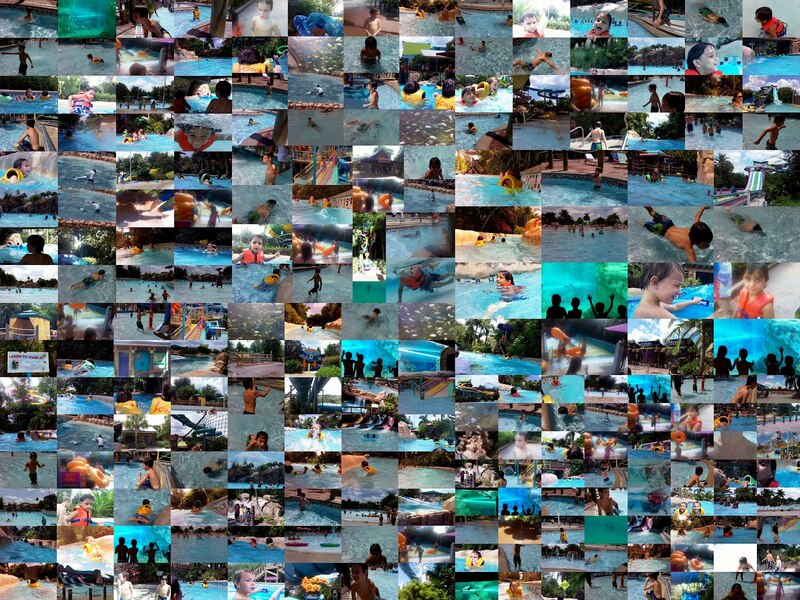 Please note that Aquatica is a family experience, therefore we ask that the appropriate swim attire be worn throughout your visit (i.e., no bathing-suit thongs, please). In addition, children in diapers are required to use waterproof protectors. 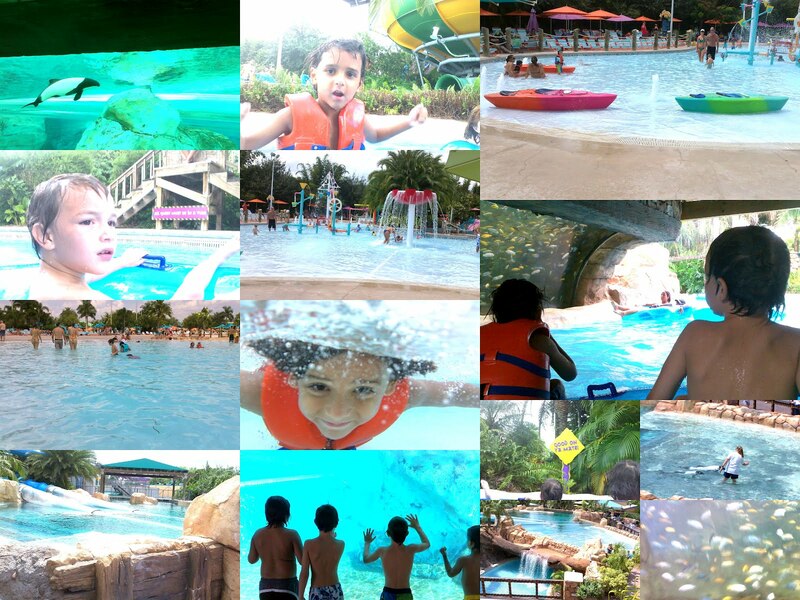 In order to guarantee our guests' comfort and safety, Aquatica's capacity is limited. Admission into the park may be suspended during the day due to periods of high attendance. Busch Gardens Shuttle Express provides an easy, comfortable & quick way to Busch Gardens, Tampa Bay. For the latest park operating updates or additional park information, call 1-888-800-5447 or 001 (407)-351-3600. Click here for Operating Schedule. Click here to purchase your parking online. Aquatica has several different dining options including an all-you-can-eat restaurant and healthy alternatives. Gift shops feature a wide selection of brand-name sportswear, beachwear and other "must-have" summer items. A one-time locker fee gives you a full day's worth of unlimited access. Small lockers are $12.00* and large lockers are $15.00* per day. 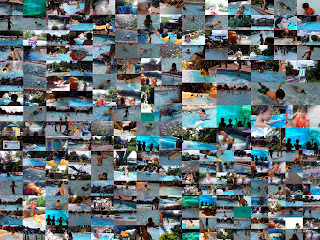 Beach towels can be rented for the entire day for a $4.00 each. Towels can also be purchased at any of our shops throughout the park. Life vests can be checked out free of charge throughout the park. A private cabana is the best way to take in all Aquatica has to offer. Your cabana is reserved exclusively for you for the entire day, until the park closes. Cabana rentals include a refrigerator stocked with bottled water as well as complimentary use of towels and lockers. While a security member is always present in the park, locker usage is recommended. Snacks and dining options are separate. As cabanas provide the comfort of a shaded, sheltered environment, guests are welcome to move seating outside of the cabana to soak up some of the warm Florida sun. Click here to reserve your private cabana. For the comfort and safety of all of our guests, smoking is permitted in the park in designated smoking areas only. These designated areas are conveniently located throughout the park and are clearly marked on park maps. 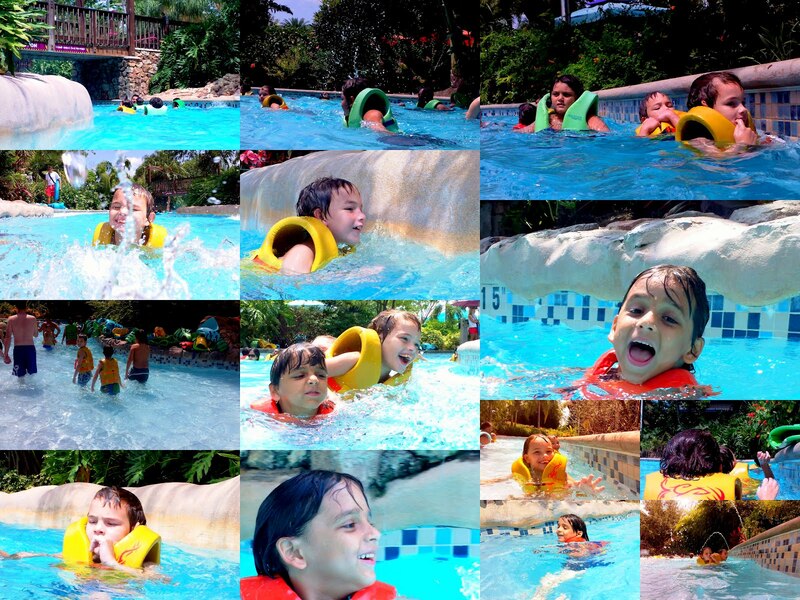 At Aquatica, the water is as warm as the South Seas themselves--actually, warmer. We have a state-of-the-art climate control system that adjusts the water temperature according to the weather so that it's always just right. The water can be heated up to 84 degrees. Aquatica has clear limitations on what types of food/beverage purchased outside are allowed to be brought in to the park. Coolers are permitted, but they must be no larger than 16-quart size; large insulated bags are available for purchase at Guest Relations. For guests with special dietary requirements a limited number of unlimited daily picnic size lockers are available for rent at the park. Two picnic areas are located at the bus drop-off area at the front of the park and guests may re-enter these areas as often as they would like during an operating day. For your safety, the following items are not permitted inside Aquatica: Glass containers, firearms, straight blade knives, large pointed scissors, pocketknives with a blade over two inches, pepper sprays, utensils and flammable liquids. For the safety of our animals the following items are not permitted inside Aquatica: Plastic straws, balloons, cup lids. To best serve you and assure a safe and enjoyable dining experience, we ask that you please read and understand ALL of the important information below. WHAT TO DO: Upon arriving at a meal facility, please go straight to the cashier and ask to speak with a supervisor to discuss the severity of your allergens and determine a meal that will be safe for you. OFFERING OF SPECIALTY ITEMS: Our park offers several allergen friendly prepackaged items for your special dietary needs. For a list of these items and their location, please ask to speak to a supervisor at our main meal facilities. CROSS CONTACT: Not all of our meal facilities are free from cross contact. In order to ensure your meal is safe, please discuss the preparation process for your meal with the supervisor as you place your order to ensure no cross-contact takes place. TIPS FOR A SAFE TRIP: Follow these tips to allow us to best serve you and ensure a safe and great dining experience with us! Still have a question? Contact us here. This information is provided for informational purposes only by SeaWorld Parks & Entertainment, Inc (SEA). Neither SEA, its parent, subsidiaries, affiliates, suppliers, vendors, and/or employees assume responsibility for sensitivity or allergy to any food product or ingredient provided by or in our parks. 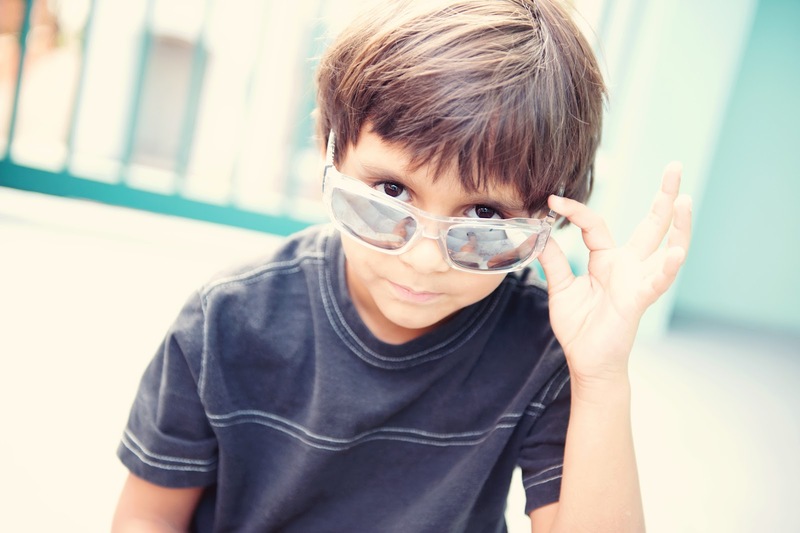 Except when participating in an event intended for young guests such as our Adventure Camps, sleepovers, birthday parties and educational programs, SeaWorld Parks & Entertainment suggests that visitors 13 and younger be accompanied by an adult. SeaWorld Parks & Entertainment is committed to providing guests a safe and enjoyable experience. Because of different pathway configuration and terrain as well as large crowds that include small children and strollers, we regret that we cannot permit the use of two-wheeled, self-balancing electric vehicles such as Segways. We are pleased to offer other forms of personal transportation, including electric convenience vehicles and standard wheelchairs and we encourage you to contact Guest Services with any questions you may have. For your convenience guests may have their height checked at our concierge cabana. Colored wristbands and signs will indicate which attractions are accessible to each guest based on their height. In general, guests must review and comply with requirements posted at each attraction, those under 48 inches are required to wear a life vest and must be accompanied by a supervising companion. Guests must be at least 42" tall, life vests are not required on this attraction. Guests must be able to maintain proper riding position holding on to both handles unassisted. Maximum rider weight is 300 lbs (136 kg), single riders only. Guests must be at least 48" tall. Guest must be able to maintain proper riding position. Maximum rider weight is 250 lbs (114 kg), single riders only. Guests must be able to maintain proper riding position holding on to both handles unassisted. Guests under 48" are required to wear life vest. Combined maximum rider weight is 400 lbs (181 kg). Guests must be 42" to ride, must be able to maintain proper riding position holding on to both handles unassisted. Maximum rider weight is 600 lbs (272 kg). Guests must be at least 48" tall, life vests, shirts or cotton shorts may not be worn on this attraction. Guests must be able to maintain proper riding position. Maximum rider weight is 300 lbs (136 kg), single riders only. Guests under 51" are required to wear a life vest. Guests under 48" are required to wear a life vest. All guests must be in a single or double tube. Guests must be between 36 and 42 inches for slides into the main pool and over 42 inches for the larger slides that are dispatched by a lifeguard. Guests under 48" are required to wear a life vest on the larger slides. Still losing your socks in the dryer? Try my solution! So with all the family I have, 2 kids in school and work we go through socks. Lots of sets get lost and never to be found again. I figured out a simple solution on washing your socks, drying and keeping them together. You put all your socks in a pillow case tie a knot at top. Don't over fill it but about a quarters worth full so they have room to flop around and get washed same for drying then you pull out the pillow case, and there you have it all your socks clean and together. Also this works for bras which its always a good idea to clip the bra together before washing so it does not tangle with the rest of the clothing. Not the greatest idea to dry bras with wires though that's when most will lose shape or break. I am sorry it has taken so long to post this. Okay so here it is, the stuff does work. I had a hard time following up with the post because Mederma is like an antibiotic, you have to use it every day twice a day. I am horrible when it comes to long repeats, especially when it's out of site out of mind. I was able to keep up for about a week. I was more focused on Brian because has the worst, but the issue with him is its on his stomach which is always covered with a shirt. I noticed a fade effect within a week and then it seemed to fade even more over a month time. Even though I did not follow the instructions I did place on his scar as often as I had the product and him in the same place at once and remembered. I gave up on Elizabeth because hers is on her head and so small that it was hard to rub in along with getting in her hair. Brian was on top of me here and there about putting it on him. I would give him a small amount and he would rub in himself. We used the adult formula on Brian because I figured faster results with half the work of the kids one. I would recommend for parents who are on top of things or for a child or adult who can remember to do so everyday twice a day. I had a hard time but when I remember I do have him use it. I think it will go away even though my results will take a lot longer then the 30-40 days because I am not using correctly. I believe the product will do as said if you can use correctly because I did see results within a weeks time. I also did not have any fresh scars to test on so I could only imagine how fast that would work. I couldn't get pictures because it was hard the first time so now that it has faded more you can only guess how hard it would be to get a pic. If your really effected by your scars I would 100% invest the $15 dollars on a tube of Mederma it will and does work! Win a Kmart Prize Pack from Mocha Dad! Never Be Bored Prizepack Giveaway from Mocha Dad! On October 4th Rocket Delta will head up into space! I had the chance to visit the complex this year, its under construction for the new Atlantis Project which they will have Atlantis inside a building and you will be able to touch it and be on the space shuttle! This opens July of next year (2013). 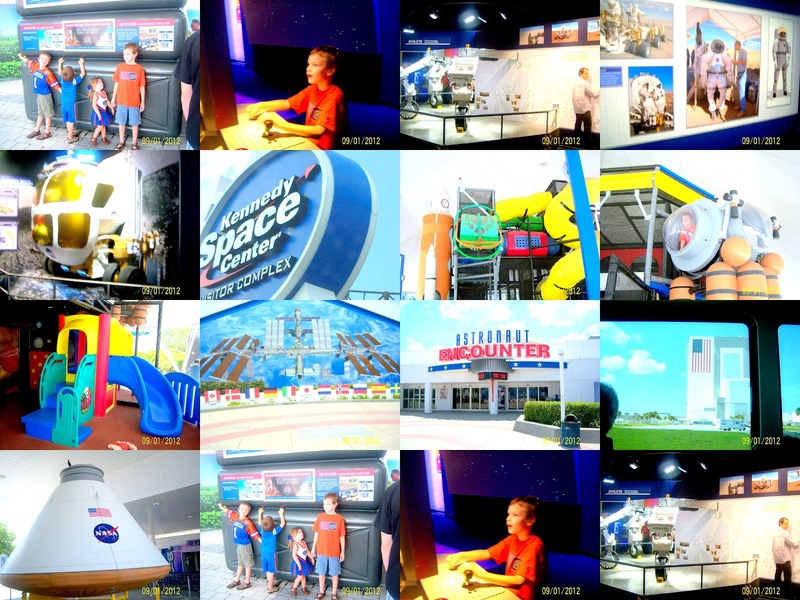 Kennedy Space Center is a great place to take your kids for education, I would recommend for kids 10 and up because its a lot of reading, also most of the center is bus trips everywhere. 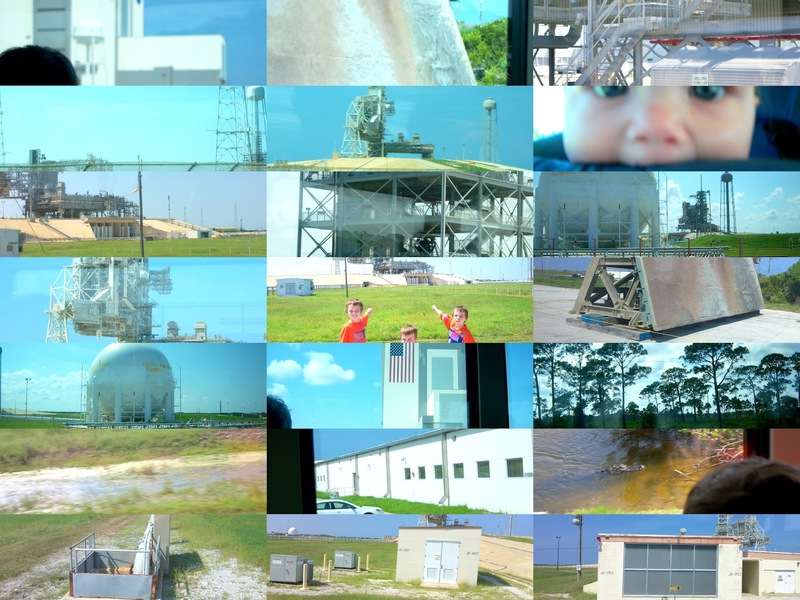 We got the package that included a once in a lifetime up close on site of the launch pads! This was pretty cool although you don't get to get right up there your only less then half a mile away from where they take off at. The tour was about an hour on a bus. My kids favorite thing of the day was the playground. Lol they wanted to spend all day there! Its a really nice set up which has picnic tables around it for parents to sit and relax, the play area is big enough for parents to run around if you want to. They even have a separate play area for younger kids like 4 and under. Second day free for use at the U.S. Astronaut Hall of Fame® if used within seven days to allow guests to get the full experience. All vehicle traffic is routed to a parking toll plaza equipped with parking toll booths. Rates are as follows: $10.00 per automobile, $10.00 per motorcycle, $15.00 per motor home/RV. Annual pass holders receive complimentary parking with proof of an annual pass. Kennedy Space Center Visitor Complex is open daily from 9am-5pm. I was recently given to opportunity to take some pictures at no cost, since she was so nice to do this I thought I would pay it forward by getting her some followers and showing off her awesome work! Giveaway is sponsored by me, I was not paid in any way for this. Tickets are $17.95 for an adult and $14.95 for a child. Clearwater Marine Aquarium is the place to go if you want to meet "Winter" from the movie "Dolphin Tale"
We were invited to bring the 7 kids and we had a great time! The kids all really enjoyed getting to see Winter. Clearwater Marine Aquarium is located in Clearwater, FL which is close to Tampa, about 90 minutes from Disney, a very easy freeway drive the whole way. 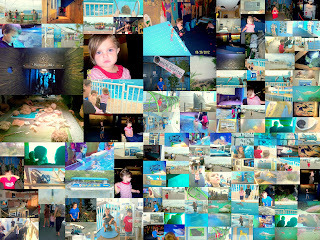 There was alot to do there, like looking at otters, watching dolphin shows, as a live touch tank where the kids got to put their hands in and feel everything! 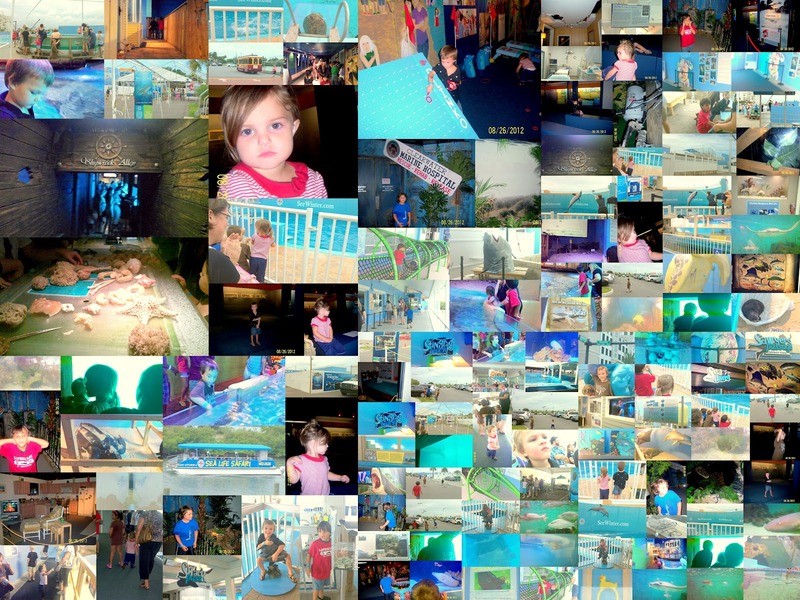 If you get a chance, please go check out Clearwater Marine Aquarium! 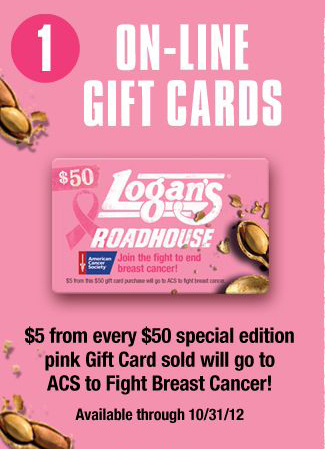 Like Logan's Resturant, wanna help fight breast cancer? A two-year old child recently died after getting her head caught inside the blind adjustment cord, which is not attached to the wall or floor. 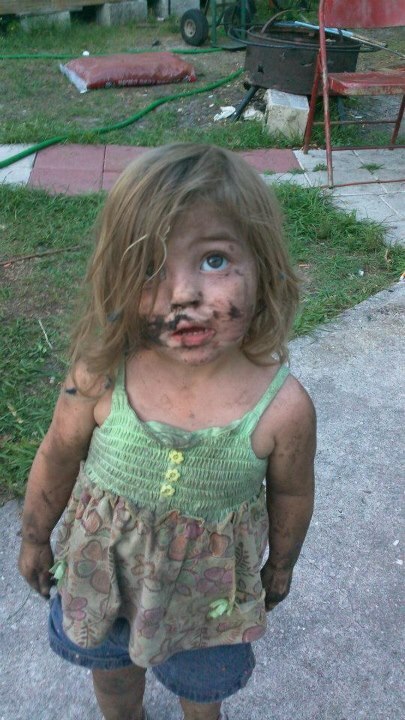 If you have kids please contact, WindowCoverings for a free repair kit, before its to late. Our Whiskey Lullabye Fun Spot Giveaway! I was born raised in Kissimmee, FL and my whole life my parents dragged me everywhere in FL. 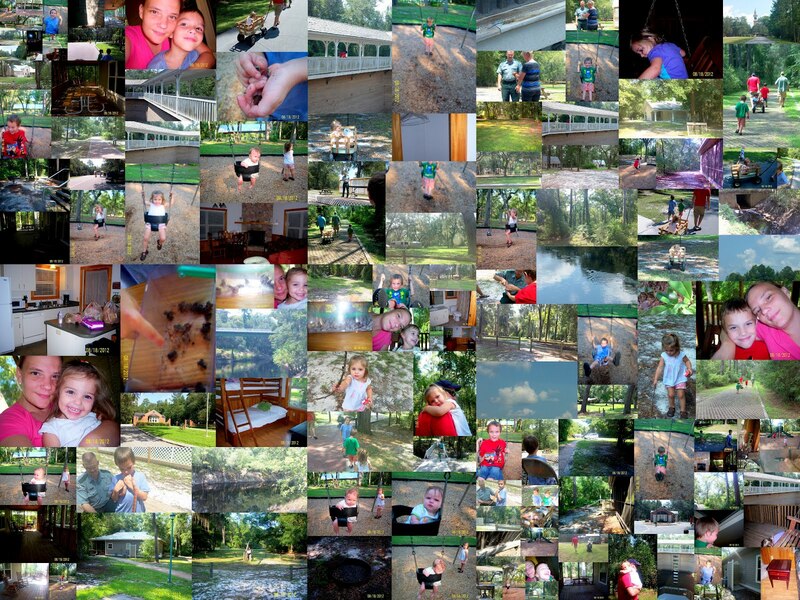 One of the places that I had not been to until this year was Stephen Foster State Park. 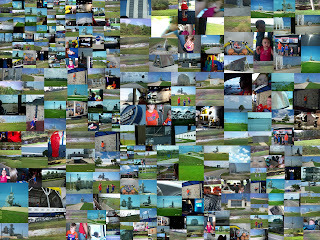 My parents, grandma, and my family all went to the park for a weekend trip. 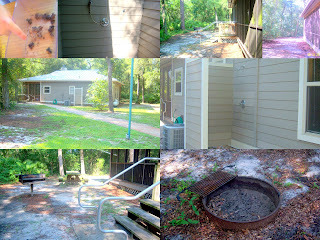 Stephen Foster State Park, is about 3 to 4 hours from Disney but a gorgeous getaway from the city. I had worked the night that we left, we got to the park at 6am! it was covered in fog and very hard to see. 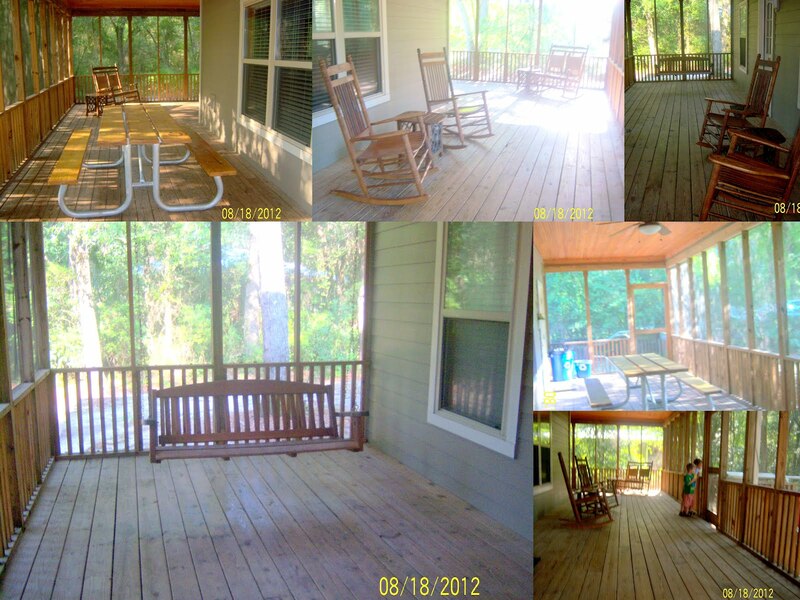 My parents had got us 2 cabins, one for them and my grandma, then we had one. The cabins are huge! They rent for only $100 a night, there is NO TV, phone or internet!! If you wish to visit the park its only $5 per car, and then $20 to pitch a tent. My first thought was wow this is really nice, then it got better when we got inside the cabin. 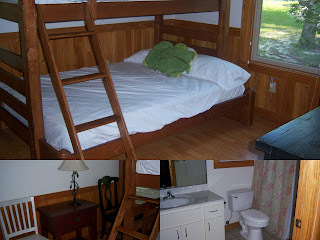 The cabins are 2 bed 1 bath, the first bedroom has a queen bed, the 2nd bedroom has bunk beds, full on bottom and twin top. I didn't get a picture of our room I think just cause I was only in it to sleep. 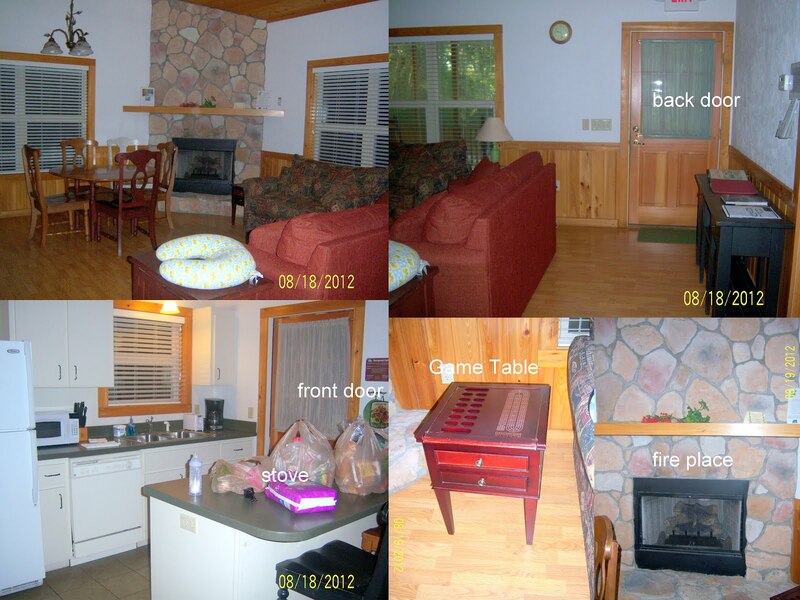 The cabin has a full kitchen which comes fully stocked with pots, pans, dishes, dish soap, dishwasher, full fridge, stove, sink,and of course cabinets. The living room has a nice dinning table with big wood chairs, a counter with 3 stools to sit at kitchen, a propane fireplace (this is only used during certain months), game table, couch and loveseat, hard wood floors and notebooks. The notebooks were a fun surprise that I found in a drawer on the side they have all the stories of people who have stayed in the cabin which we made a page. The best for last! The full wrap around porch! 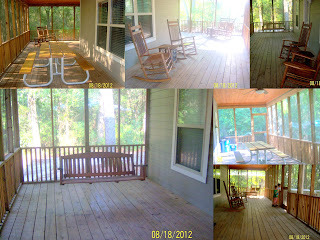 Just to get into the cabin you enter the porch, its fully screened in. First thing on the porch is picnic table, then double rocking chair, then around the corner you have 2 single rocking chairs, and the best a porch swing! Love it! Along with all this you have ceiling fans and lights, porch lights and steps out the back to fire pit, another picnic table, and grill. At Stephen Foster State Park they have many things to do other then just camp. They have a 200ft bell tower that plays concerts daily. 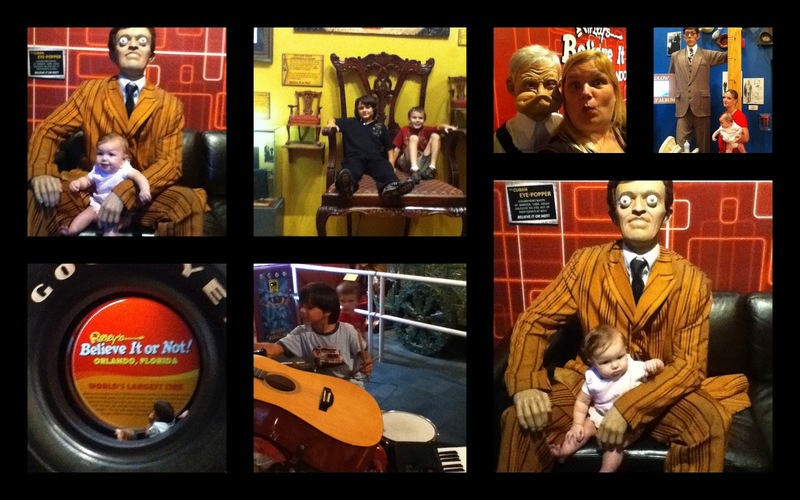 A museum that features eight dioramas depicting Stephen Foster songs. Also on display are historic pianos and the desk where Stephen Foster penned the final touches to Florida’s state song “Old Folks at Home” or commonly called “Way Down Upon the Suwannee River.” This is free to visit upon the entrance fee of $5 per car. Then of course the Suwannee river which has a boat access area in the park. They also have a small town like setting which has about 5 shops like black smith, quilting and candle making. 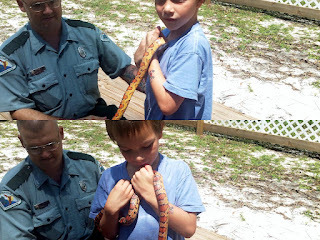 Like most parks they also have 2 nice good size playgrounds for children, and have educational shows which we attended one about snakes which my dad held his first snake as well as Michael. 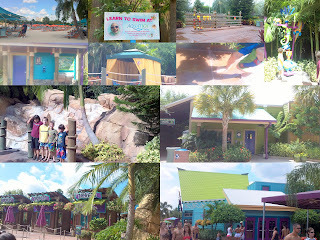 If you wanna come to Florida and see something other then just Disney then I would make this a place to stop and enjoy. I had a great time as well as my family. It was a nice break from all the busy everyday norm. iPad3 Holiday Event is hosted by Mom Blog Society. I am a huge truck child. My first car was a 93 Chevy S-10 stick shift, which after that I got my 95 Ford F150, straight 6, stick shift, and now a 98 Dodge Ram 1500. I love trucks cause of the many uses they have. I also loved to attend Monster Jam which has the monster trucks Grave Digger and Big Foot. I hoped to pass this love onto my daughters Elizabeth and Sarah. 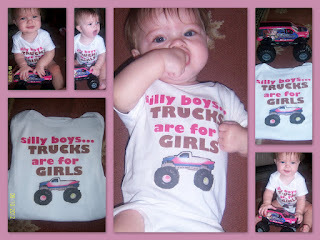 I came across the shop StillHavingFun which has a cute little onesie that says Silly Boys... Trucks are for Girls and I had to have one for Sarah, so I was thrilled to review it. It's a onesie so its easy to put on and the quality is very good. I had to wash it not to long after she wore it cause she spit up and it still looks great infact I think you should wash before wear as it tighten and softens the fabric. I love the shop StillHavingFun they have many cute sayings that I would love to also get. ie; I love Grammy, Girl you make my speakers go boom boom, another favorite of mine is oops...they did it again. Love it! All items are $14.99 to $17.99. They can make the onesies in Pink, Blue, Yellow, Mint Green, and then also a Ash Grey for toddler tees. It depends on the design, but a lot of their designs (particularly those with words), they can do in any font color. Check out StillHavingFun for a one of a kind Christmas/Birthday/Baby Shower gift, or for just plain fun like I did. Also the owner of Still having fun would love to host a giveaway which one of our readers will receive a item of choice from their store. Open to US residents only. For all other we have a code that you can enter to save 10% off which is SAVE10. So, in my family because of my husbands schedule and one vehicle, and the face that my kids are virtual schooled (they don't have set hours) we stay up pretty late. One night a couple of days ago I wasn't feeling well and wanted the kids to go to bed at a descent time, but that's kinda hard when they wake up at noon! About 20 minutes later I checked on them and they were both asleep! In the morning, when Xander came out of bed the first thing he said was "Who won?" I thought that was pretty smart, I was really just going for them being quiet, and in turn got them to both sleep! This is definitely a place to go with older children, our kids all enjoyed it, but we as adults didn't get to stop and read and really enjoy because there was too much for the younger ones to get into, or run away from. I was in shock on how there is really not that much to do once inside it looks like a huge 2 story building but it was far from that, it was like a maze, you kind of walk from room to room. Also you can take strollers, wheel chairs which there was 3 stairs to go up, and some areas it was a tight squeeze to get through with stroller and kids. The kids loved the Bug car it was covered in instruments and they had a blast playing on it. I liked that fact about ripleys that they allowed for hands on because most places you touch anything and they will freak out but there were a lot of hands on things at ripleys. I have watched the tv series many times so it was neat to see some of the things in person. It's a great place to let your mind wonder, and neat for those looking for a new look on certain aspects of life. 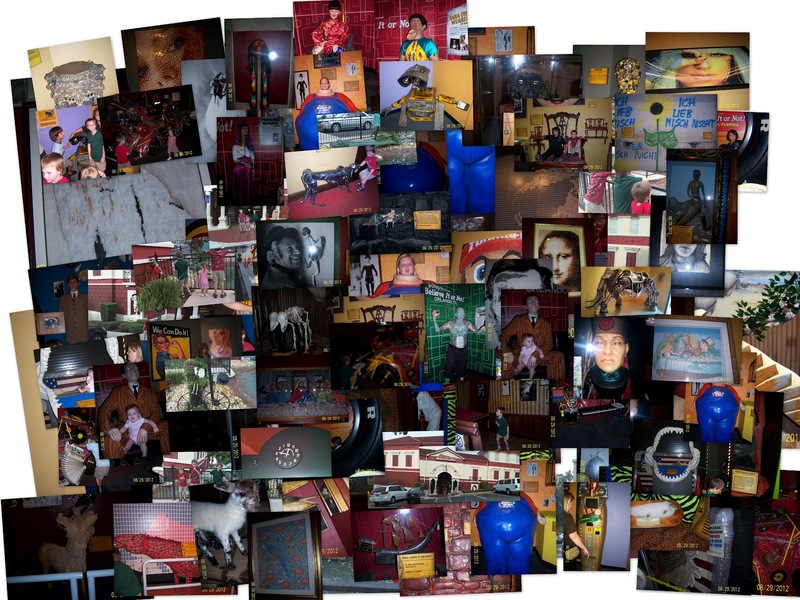 We had a good time but yeah I would recommend for persons of at least 10 and up so everyone can really enjoy what all strange and bizarre things they offer. Julia Scott of BargainBabe.com says she was able to furnish her newborn baby’s nursery for just $260, taking advantage of the fact that parents will use their crib, changing table and other nursery furniture for only a couple of years before putting it away in the attic. That means there’s loads of baby furniture to be had at dirt-cheap prices if you buy it used, and most of it should be plenty sturdy. She brings the same philosophy to buying baby clothes. Take them up on their offer. I had my tubes cut and tied. Has anyone else had this done and then become pregnant after? and if so how long after? I am stressing over this because it was so much pain and I really want to move on with my life. I am trying to convince my husband to get a vasectomy but he is totally against it you know the whole "it will take away from my manhood". Anyhow I wanna know how many have had this done or know of anyone who have and ended up pregnant cause now I am seeing that its like 1 in 1000 which is not horrible odds but for as many women there are those are not high enough numbers for me to be happy and feel like I am done. Thanks for all the feedback. Outfits by FairyTaleFrocks Review and Giveaway! Linda the owner of FairyTaleFrocks sent me 2 outfits for Elizabeth, 1 for Joshua and 3 for Sarah to review. Linda had sent me some pictures of the outfits before she had officially sent them and the pics did not do them justice! Let's start with Elizabeth. Linda sent 2 outfits. 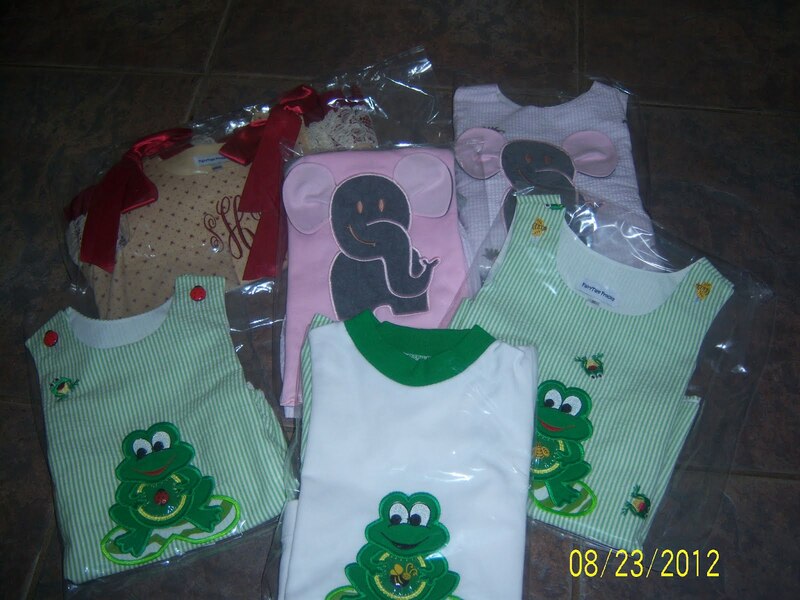 First a 2 piece set with elephants and the other a frog dress. The dress is super cute it's a seersucker type and washes great. The dress is a 3T which is big on her now but she will fit into great once she is 3 which is in a few months. I love the length and over all look of it, her dress had bumble bee buttons on it as well as one in the frog's tummy. The dress is green and white with white liner inside. The elephant outfit is also super cute. The elephant is made of a satin felt on a cotton sleeveless tank. The shorts have little elephants all over and are made of seersucker just like the dress. The elephant is really cute grey with pink ears and the outfit is pink with grey liner, and shorts are white and pink. Even the pictures I tried to get do not do these outfits the justice they so very much deserve. Elizabeth would not stay still to get anything great for a picture because with the dress she liked to pull up over her head and spin, the elephant she just loved so kept looking and pointing at it. Sarah received 2 handmade rompers. They both matched Elizabeth's. Both rompers were size 6 months which run a bit big but are really cute, and I like that they run big because I will have longer to enjoy them. I would say they fit more an 8-9 month old. 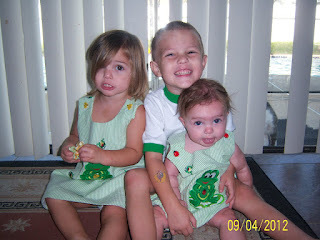 Sarah's romper had the frog like Elizabeth's only hers had ladybug buttons and a ladybug in the tummy of the frog. I loved the elephant romper the best. Both are cute but the elephant just stood out to me. Both rompers are made from the same as Elizabeth's dress and shorts. I like that the snaps to the rompers are sewn on a heavy piece of cloth so that they will not rip off like you deal with most snaps. Linda also made a very cute monogrammed dress for Sarah so it is S.H.J which is absolutely cute but its a size 18 months so will be a little while until she can wear it but really the way Sarah is I think she will fit fine at 12 months. I Can't wait. 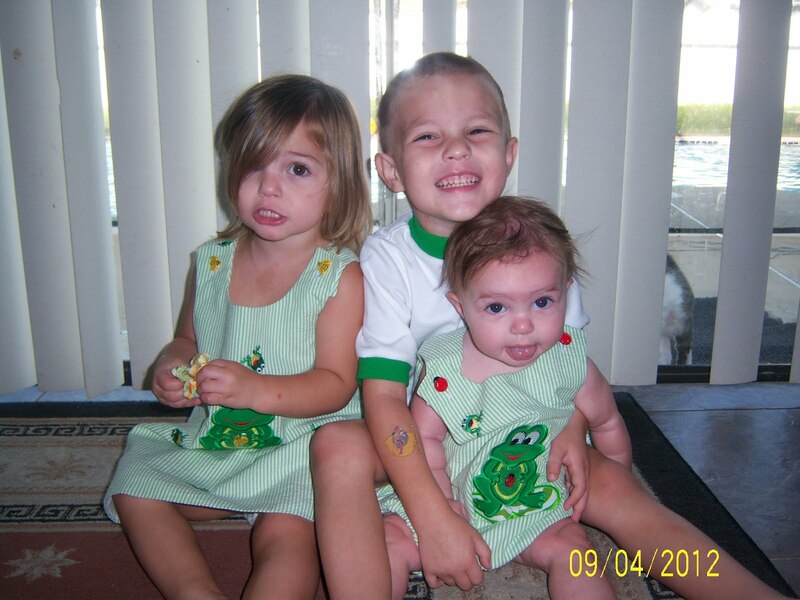 Joshua received a cute 2 piece set with frog and shorts that matched his sisters. His shirt is 100% cotton extremely nice and very cute. He had the bumblebees like Elizabeth for buttons. His outfit was a 4t which is was right on the money any smaller and it would not fit. Joshua loved the frog outfit and would not take it off the rest of the day. The pictures were taken a few days after that when he had more important issues like playing in the backyard which not gonna happen in that outfit. I loved how all the outfits turned out this was the one pic I got of the group that I think turned out pretty cute. Its extremely hard to get a pic of all of them together because Sarah is teething, Elizabeth is 2 and Joshua wants to do his own thing. My pictures still do not do the justice these outfits deserve but I love them. Linda's shop FairyTaleFrocks has many of her one of a kind handmade clothing and blankets which are priced from $20-$60 she can make probably almost anything you ask for. So my son Brian for some reason had ringworm YUCK! He has had it before which the first time it was the size of a quarter behind his ear, it took almost 2 weeks to go away. This time it was the size of a dime when I noticed it, normally you use Tinactin (which is a over the counter drug that can be bought almost everywhere) but I didn't have any laying around. So I decided to use Vagicaine which is a anti-itch cream, I did 2 treatments of it and you wouldn't even notice he had the ringworm. I was extremely happy it worked cause another 2 weeks would have drove me nuts, this was only 2 days of it showing. So I guess I am not a "big" part of the 7 kids and us, because I only have 2 of the 7. But my small contribution is that I have 2 really great boys Xander and Riley who are 7 and 6. I virtual school them 5 days a week, they are with me 24/7 even when I go to work I take one of them with me. I am a firm believer in not letting someone else raise your kids. My husband is from Guyana, we met in 1993 and got married very soon after that, then waited more than 10 years to have any children. Our 18th anniversarry is very soon! I like girl stuff, like make-up, perfume, pretty hair things..and I am really into my electronics. I am up to trying almost anything, I am very outgoing. I like things that make my life a little more stress free. I like being outdoors, I like to write, I hate to read though. I am very laid back when it comes to raising my kids, I never read the "age limit" on toys I figure if they like them then who cares. I love anything with wheels, like trucks, cars, wagons lol anything. I also would like to lose some weight about 20-30lbs, a diet that does not make you drink lots of water I hate water, love milk. I have been with my husband since age 16 known him since Elementary school, both of us are born raised in Kissimmee, Fl. I had Brian 9 months after we got married, we married on Josh's 20th birthday which is Nov 15th. We will be married 9 years this year. Riley is 10 years old, his interest include making you tube videos, playing on his Xbox One and PS4, Learning how to write his own video games, and everything STEM. 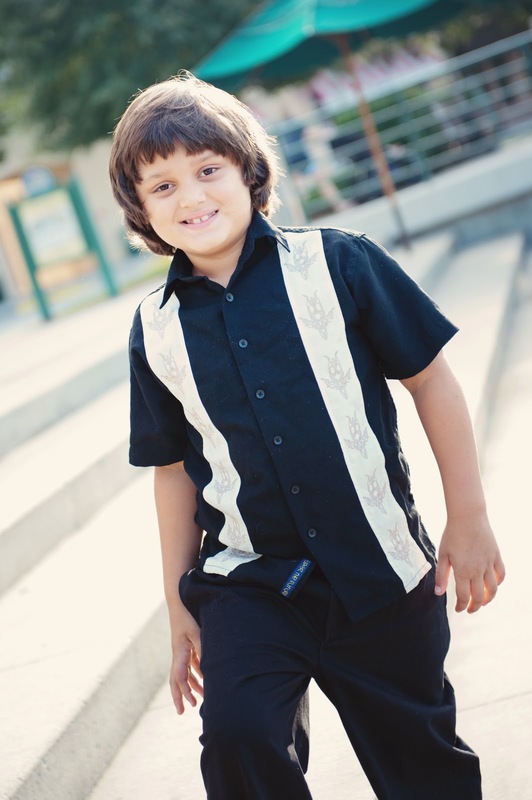 Xander is 12 years old, his interests include catching bugs and frogs, Halo, Minecraft and Call of Duty. He has an Xbox One and a PS4 and loves to review and play new video games. Elizabeth is 4 going on 20 she loves clothes, loves cars hates most girl things. She loves the dirt is always outside digging things up for her brother Michael. She loves trucks! 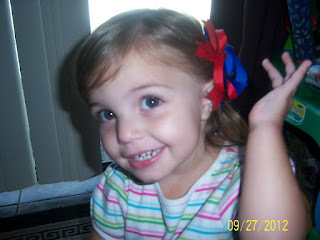 She loves to dress up and play pretend with her brother Joshua. She also loves jackets! Sarah is well over 1 loves food, eats everything and anything. 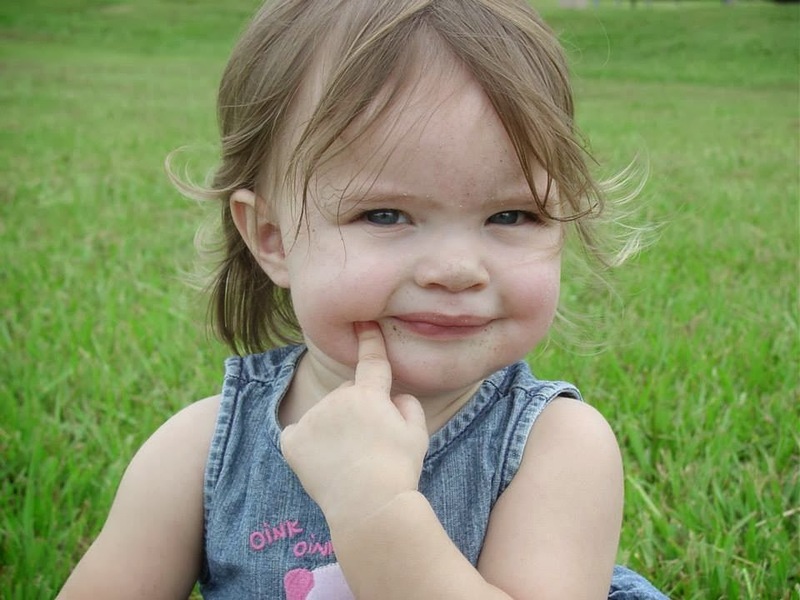 Likes to play with her brothers and sister, very dominate of all the kids lol. Loves cars, and playing house. 5 Secounds of Rain Makes for Happy Kids! 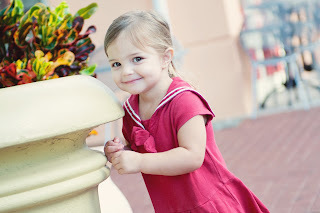 The Cutest 2 Year Old in the WHOLE World!